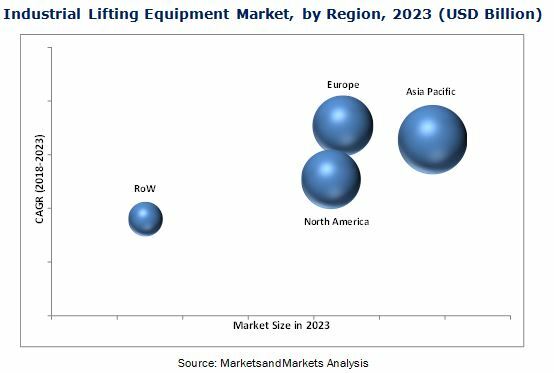 [206 Pages Report] The industrial lifting equipment market was valued at USD 61.37 Billion in 2017 and is expected to reach USD 79.73 Billion by 2023, growing at a CAGR of 4.51% during the forecast period. Increasing demand for lifting loads in the shipping industry, growing demand for forklifts in warehouse and logistics segment, and rising demand for cranes and hoists in the mining industry are the key driving factors for the market growth. The base year considered for the study is 2017, and the forecast period considered is between 2018 and 2023. The report provides detailed information regarding the major factors influencing the growth of this market. Research Methodology: This research study incorporates the use of secondary sources, annual reports, directories, and databases such as Hoovers, Bloomberg BusinessWeek, Factiva, and OneSource to identify and collect the useful information for the extensive technical, market-oriented, and commercial study of the power tools market. To find the overall market size, top-down and bottom-up approaches have been used to estimate sizes of other individual markets by using percentage splits from secondary sources such as Hoovers, Bloomberg BusinessWeek, Factiva, and OneSource as well as with the help of primary research. The market breakdown and data triangulation procedures have been employed to complete the overall market engineering process and arrive at the exact statistics for all segments and subsegments. The entire procedure includes the study of the annual and financial reports of the top market players and extensive interviews with industry leaders such as CEOs, VPs, directors, and marketing executives for key insights (both qualitative and quantitative) pertaining to the market. The figure below shows the breakdown of the primaries, on the basis of company type, designation, and region, conducted during the research study. Key players involved in the industrial lifting equipment market include Toyota Industries (Japan), KION Group (Germany), Hyster-Yale Material Handling (US), Oshkosh (US), Linamar (Canada), Konecranes (Finland), Cargotec (Finland), Terex (US), Tadano (Japan), Liebherr (Switzerland), Manitowoc (US), Ingersoll Rand (Ireland), Mammoet (Netherlands), ZPMC (China), KITO (Japan), XCMG (China), Zoomlion (China), and Columbus McKinnon (US). In this report, the overall industrial lifting equipment market has been segmented on the basis of four lifting equipment forklift, aerial work platform, crane, and hoist. With the given market data, MarketsandMarkets offers customizations according to the company’s specific need. The following customization options are available for the report. The industrial lifting equipment market is estimated to grow from USD 63.96 Billion in 2018 to reach USD 79.73 Billion by 2023, growing at a CAGR of 4.51% between 2018 and 2023. The increasing demand for lifting loads in the shipping industry, growing demand for forklifts in warehouse and logistics segment, and rising demand for cranes and hoists in the mining industry are the key driving factors for the growth of the industrial lifting equipment market. However, the high initial cost associated with industrial lifting equipment hinders the market growth. The market has been broadly categorized into four lifting equipment forklifts, aerial work platforms, cranes, and hoists. The market for cranes and hoists segment has been classified on the basis of type, operations and industry. The market for forklifts segment has been segmented on the basis of type, class, and application. The aerial work platforms segment has been segmented into type and application. In 2017, cranes held the largest share of the overall industrial lifting equipment market. Cranes are an integral part of the global material handling industry. The increasing demand for construction machinery in the construction industry and in the mining industry for ore extraction are driving the demand for cranes. The market for hydraulic cranes by operations held the largest market share in 2017. Hydraulic cranes are widely used for hoisting and moving heavy materials in shipyards, warehouses, and industrial workshops. Moreover, hydraulic cranes are used in transport, manufacturing, and construction industries. The market for wire rope hoists held the largest market share of the hoist segment in 2017. Wire rope medium changes according to the load capacity of the hoists, and these hoists are powered electrically or pneumatically, and are mounted overhead on the bridge beam with the help of a trolley. Wire ropes are widely used in the production environment because they offer fast lifting time. In the hoists segment, Asia Pacific held the largest market share in 2017. The need for increasing the production output without compromising on quality standards has affected the manufacturing sector in China and India. Manufacturers and suppliers are facing challenges in terms of the increasing labor cost and higher lead time caused by manual processes. Hence, companies are automating their processes, thereby driving the hoists market in Asia Pacific. Competitive advantages of electric forklifts such as eco-friendly nature, and low operation cost, compared to other forklifts, have propelled the growth of the electric forklifts. In 2017, diesel forklifts held the largest market share of the forklift segment. However, the demand for electric forklifts is expected to gain more traction in the future, as they offer improved energy efficiency and low noise level and are best suited for indoor industrial environment. 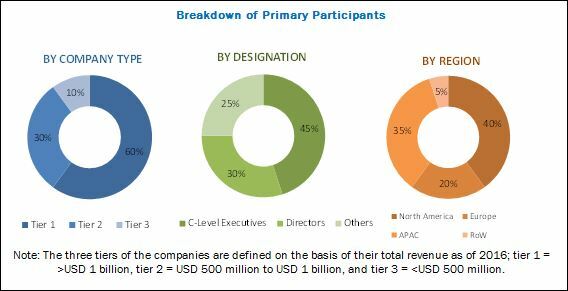 Asia Pacific is estimated to account for the largest share of the overall industrial lifting equipment market. However, the industrial lifting equipment market in Europe and North America is likely to witness substantial growth. Asia Pacific is the most lucrative market for cranes and hoists, owing to the significant investment being made for construction activities in the region. The rising need for infrastructure in developing economies such as India and China supplements the growth of the industrial lifting equipment market in this region. The major challenge for the industrial lifting equipment market is the lack of operators. The demand for skilled operators has been on the rise for years. However, most industries face a shortage of qualified engineers and maintenance staff to properly support and maintain equipment. The use of a large number of components in a crane necessitates the requirement for highly skilled labors to mount components and harness cables and operate different cranes and hoists to lift and lower objects. Some of the key players in the industrial lifting equipment market include Toyota Industries (Japan), KION Group (Germany), Hyster-Yale Material Handling (US), Oshkosh (US), Linamar (Canada), Konecranes (Finland), Cargotec (Finland), Terex (US), Tadano (Japan), Liebherr (Switzerland), Manitowoc (US), Ingersoll Rand (Ireland), Mammoet (Netherlands), ZPMC (China), KITO (Japan), XCMG (China), Zoomlion (China), and Columbus McKinnon (US). These players are focusing on product launches and developments, acquisitions, and collaborations to enhance their product offerings and expand their businesses.